BrewNymph®: Ready to "Flip Flop Til You Drop"? 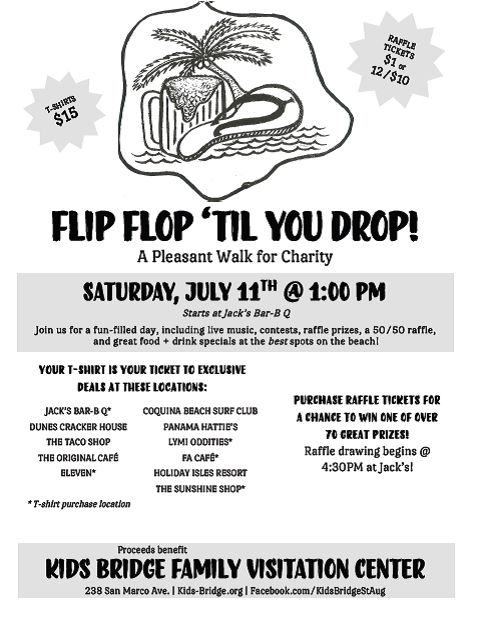 Ready to "Flip Flop Til You Drop"? Walk it or ride it. Enjoy food and drink specials. Support local St. Augustine Beach businesses. And, last but not least, support a local charity. 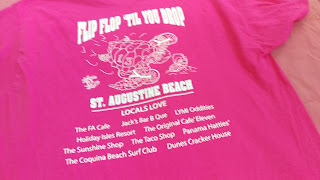 Grab your special t-shirt -- then put your creative touches on it -- put on your flip-flops, and get ready to "Flip Flop Til You Drop"! 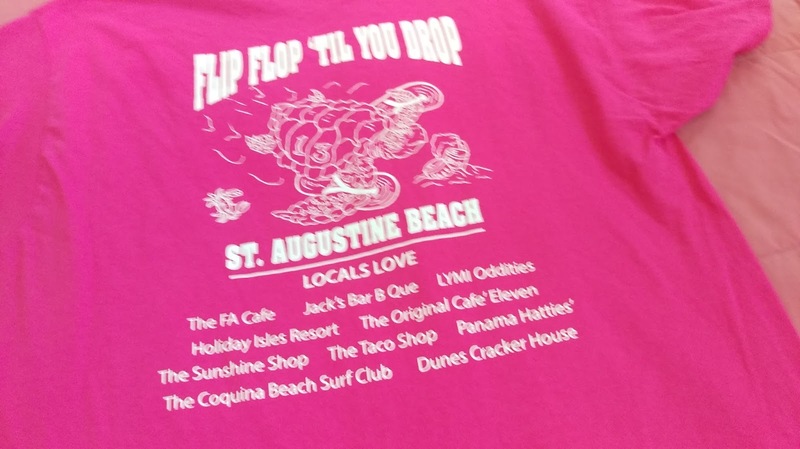 Just go to one of these places on A1A Beach Blvd., St. Augustine Beach, and purchase your shirt for $15: Jack's Bar-B-Q, Original Cafe 11, LYMI Oddities, FA Cafe, and The Sunshine Shop. Just a friendly hint, though, the shirts are selling quickly, and you may have to visit a couple of these locations to get the size you want. But, that's OK, have a beer, sandwich, or look around at the cool stuff while you're there! So, what's this all about, you ask? It's been dubbed a "pleasant walk for charity." Proceeds from the event benefit Kids Bridge Supervised Family Visitation Center, located at 238 San Marco Ave., in St. Augustine. Kids Bridge is a safe venue which provides on-site supervised visits between parents and kids (who may be estranged and/or going through difficult times), and offers educational and community services to strengthen families. I've visited the venue, and it offers a warm and welcoming environment for families in need of these services. Check out the above link for more information. And, here's how it works: First, the t-shirt. You gotta wear it. The shirt is your "admission ticket" to various participating businesses all along A1A Beach Blvd. Start at Jack's Bar-B-Q, and then simply walk up and down Beach Blvd. and stop at the places who have the sponsor signs, where you'll get discounted prices on food and drinks. So, yeah, that means there's some drinking involved -- in case you didn't pick up on that. And, you get to meet some really cool people who also like to contribute to charitable causes and have a really fun time while doing it (really). And, there's more to that t-shirt thing, too. Get your creativity in gear, and cut up that shirt, put beads on it, put feathers on it, whatever else you can think of to make it crazy (tastefulness may be optional). There were some pretty innovative designs last year. That's me in the photo from last year's event. I didn't know what to expect, so I just made a tank top. I have some work cut out for me this year. Don't want to walk the full route? Fear not, because Old Town Trolley Tours is once again providing transportation of the wheeled kind for those of you who either want to save your energy for the big finish at Jack's, are too dainty for sweating, or are afraid of crashing your pedometer (sure, that's legit). We had an excuse last year because we endured torrential rains (but we persevered). The event ends back at Jack's for a party with music, contests (remember that t-shirt thing? ), raffle prizes generously donated by local businesses, and a 50/50 raffle. 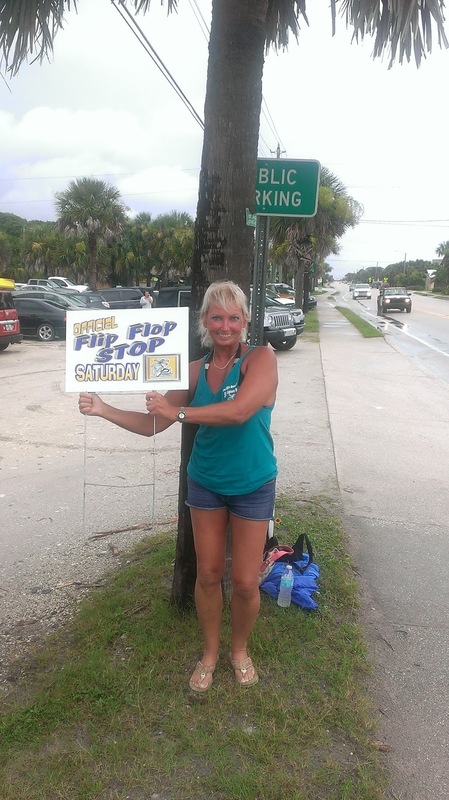 This the 13th year for Flip Flop Til You Drop, which has raised over $140,000 for various local charities. Monies are generated through the sale of the shirts and raffles. I think the dude has seen better days..
Hmmm, now what was in that cup? 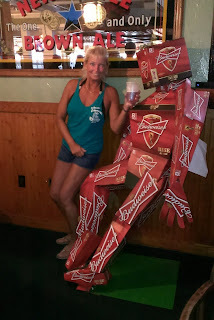 Hey, I'm always looking for info on events that involve beer/refeshments, community, beach, and the like. So, if you are hosting or organizing an event, please let me know by sending an e-mail to brewnymph@comcast.net, or by contacting me on my website, www.brewnymph.com (there's even a box to do that). I really want to know about it. One rule, though, it's got to be fun! Because like I wrote on my site: I'm fun, deal with it!